I don’t have kids, BUT, I tend to gravitate toward people who do. I have a great many unofficial nieces and nephews (more nephews than nieces) who are not actually related to me at all but who I adore. And spoil. I also have two younger brothers who I introduced to the kitchen. SO I kept these smaller people in mind when building out a kids cooking section. Kids cooking tools can be awesome and useful or awful and useless. It all tends to boil down to the toys or tools scenario. I try to stock tools that can double as toys. I love sourcing for this category too. Kids just have MORE FUN. and color. LOTS more color. I always use baking as a good way to ease kids into cooking – it’s a great entry point and measurements are exact, also who doesn’t love a chocolate-chip cookie reward at the end of a bit of work? Whenever I put together gifts for kids I pick out bowls for them – this is because it’s nice to have something that is “yours”. Yes, you (or the kid’s family) probably, already have bowls but they aren’t that expensive and it’s such a nice gesture to give a bowl with the other things. It also makes for a great gifting vessel. 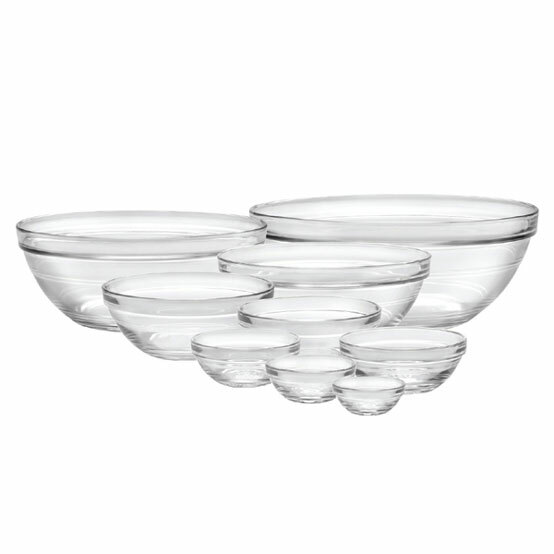 I love these nesting bowls from Duralex for this purpose, there’re nine here and they range in size from a single ounce to two-and-a-half quarts. A set of measuring cups and spoons can go a long way toward being both useful and teaching kids basic fractions too. I know that I learned that two halves made one cup better when I was measuring out chocolate chips 😉 These cups are super basic stainless steel and the measuring beakers are BPA free plastic. Not flashy but they will last your little sous chef a while before needing an upgrade or another set. I still have the measuring spoons I received when I was about 6. These things make lasting impressions. Now onto the fun bits – all good things have fun bits right? Back in March when I went to the the International Housewares Show in Chicago one of the things I came away from it with was a better relationship with A LOT of the companies and brands that I work with. At the top of that list was J.K. Adams. JK had just released the best child’s rolling pin I’ve ever seen – 6 inches long with bright red handles and a smooth rolling motion. I loved it. I immediately came home and ordered us three. I’ve kept them around and every little who notices them wants one. They are the perfect size for small hands and incredibly easy to control. What about you? Any favorite Kids Cooking Tools or books that are essentials in your kitchen? Let us know in the comments!